One of the most difficult distinctions in judging a cigar is separating the cigar from the cigar experience. For example, the other day I spent several hours on the phone with an insurance company trying to straighten out my Medicare application. I was smoking a cigar but I can’t even recall what it was. But I assure you it could have been a $500 Davidoff Oro Blanco and I wouldn’t have enjoyed it. On the other hand, I’m confident most of us can recall a smoke in a great environment that seemed wonderful, only to disappoint when returned to less stellar conditions. That is one reason why, when reviewing a cigar, we smoke more than one, and why we often remark on the circumstances if they’re anything out of the ordinary. Speaking of our reviews, you’ll find an explanation of the StogieGuys.com system here and an archive of those cigars we’ve judged to be the best here. When assessing a cigar, one of the most difficult things to do is to recognize your personal preferences. Not eliminate them, because that’s impossible. But you need to be aware of them. The poster child for this is, of course, Macanudo. There’s no shortage of smokers who’ll tell you what a lousy cigar Macanudo is. Of course, it’s nothing of the sort. You may not enjoy it—you may not be able to stand it—but it’s by no stretch of the imagination a bad cigar. It’s a mild stick with remarkable consistency, excellent construction, and a nearly unparalleled sales record. 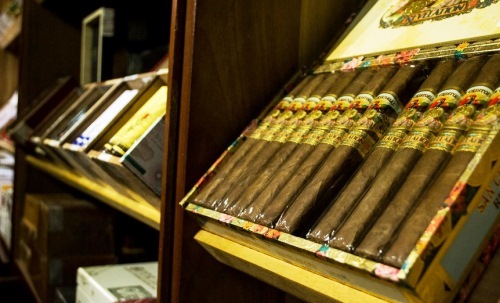 Since cigars are an object of pleasure and enjoyment, there’s no standardized scale on which they can be measured. Everyone’s tastes are different, and most people’s tastes evolve and change as they continue to smoke cigars. Cigars I once thought extraordinary I now find quite ordinary; if you’ve been smoking a while, I imagine that’s true for you as well. A truly great cigar, for me, creates an almost transcendent experience, one where you are nearly lost in the act of smoking. I know that sounds pretty highfalutin for burning a bunch of rolled up leaves, but I can feel it when it happens. But that isn’t all it takes. To be great, a cigar must perform that way consistently. Cigar people will tell you making one great stick isn’t nearly as tough as making them that way again and again and again. Construction plays a role, too. The draw must be right, the burn even and complete. Personally, I don’t assign a lot of importance to aesthetics, though they are usually good when the cigar is top-flight. But I wouldn’t let an ugly band—or no band—weigh heavily, just as the choice of a glossy, lacquered box or simple cardboard makes little impression. When I’m reviewing cigars my goal is simple: provide information and impressions to help you make choices. I prefer smoking and writing about good cigars far more than dissing bad ones. And when I come across a great one, it’s even more fun. I’m eager to spread the good news. Fortunately, there are more and more opportunities to do just that. As a retail employee, I have this conversation with at least one person every single day. I both appreciate and agree with everything you have written here.